Cash flow is the real problem here, a decent set of HT leads are required and I’ve not a penny to spend on the Corsair to try again on starting the engine. So, motivation has taken a bit of a knock, but the Corsair is not forgotten. Just added 12 scans of genuine Crayford brochures here. Not much is on line about this company that specialised in soft top conversions of UK production cars and according to the Company brochure they did some engine development too. Hopefully they’ll be of interest. 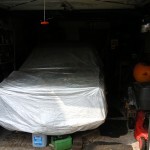 A couple of hours on Saturday saw the Corsair being prepped for it’s first crank over. The cooling system was re-filled then it was plugs out and checked. 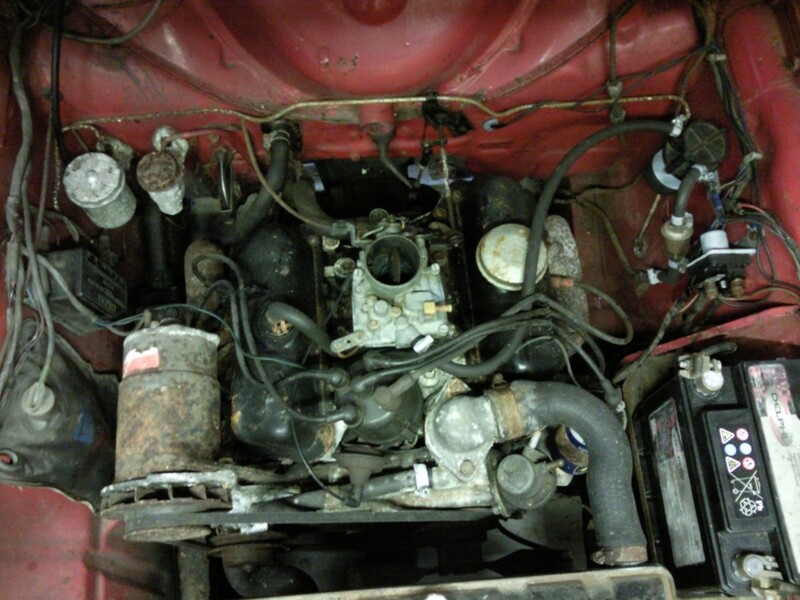 The engine was hand cranked over just to ensure it hadn’t seized and things moved freely. The mower fuel can was set up as a temporary fuel source. This was the moment that hadn’t happened for over eight years, the engaging of the starter motor and cranking of the engine. I kept the key turned and after an initial slow turn over everything seemed fine… except the engine didn’t fire. Out with each plug, and test. Well weak spark at No.1, ok on No.2, not sure about No.3 and ok-ish at No.4. Tested the HT lead from the coil, well it sparked. Checked the points gap was fine and condenser ok. Turned over… several times. 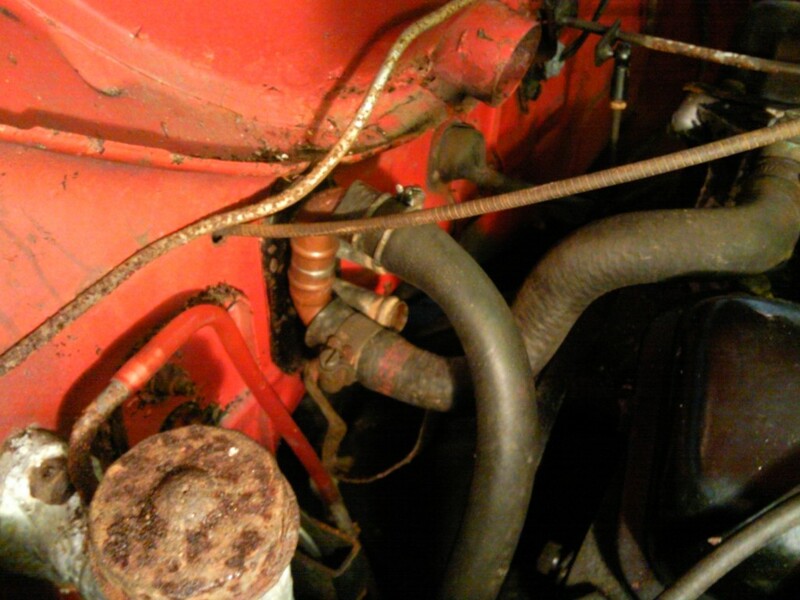 Checked the fuel was getting to carb, all ok. Re-checked dizzy cap etc, looked ok. Re-checked HT lead to dizzy, prodded the wire that would make contact with the distributor and it broke off. Answered that then! So, the battery was taken out of the Corsair and reconnected to the trickle charger with the next task to obtain newer HT leads. I came away happier that the battery was good and man enought for the job, the fuel was getting to the carb, the carb linkages were freed up and now aware of the dodgy clip mounting on the distrubuter body. Two old (dead) batteries were swapped today at a breakers near Stalbridge. I decided to keep the one I had been trying to resurect, but still had two old spares (one possibly being off the wife’s bug) kicking about. Luckily, I hadn’t disposed of them at the local recycling centre (dump) as the breakers yard took them in as a swap for one good fully charged one. Result! Another hour was spent on the car on Saturday by the fitment of the copper U pipe I had kicking around for a while as a a bypass to the heater matrix (which is suspected as being blocked). 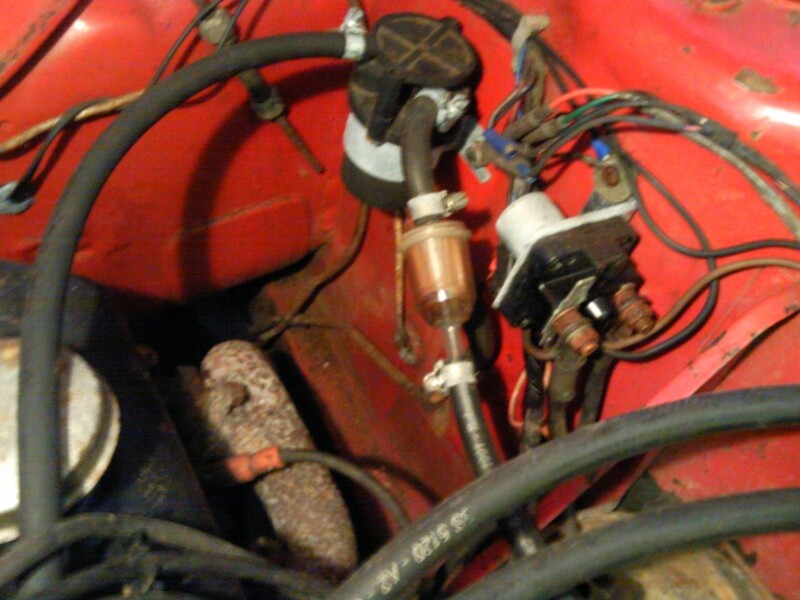 The fuel pipe to fuel filter was disconected and another pipe added which was then fed into the lawn mower fuel can. 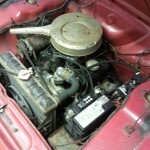 The battery was also fitted with the vain hope that it would turn the engine over but also to test that the fuel pump was sucking. which it did. The battery still failed to turn over the engine, but a fire up is getting closer. First thing Saturday I decided to put the battery back on charge. There was hope after the first round of charging a few weeks ago, as it then had enough to power the lights but not engage the starter motor. So, I drained the battery some more by attaching a lamp to it for a couple of hours last weekend, in readiness for a second & third charge session. 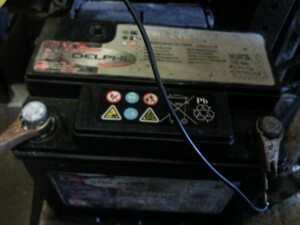 After two days of ‘high’ power charging the battery was then hooked up to a solar panel battery conditioner. This was rediscovered in a recent garage tidy up. The solar panel was fixed to the back of the garage and the cables fed through the gaps in the rear wall (sectional garage). They only just reached the battery on blocks on the floor. I told you it was going to be long and drawn out process however, things are further down the line than a few monhs back. Next week I’ll be mostly dithering over what to do next! I’ve been brain dead mostly this week. I mean, why am I wondering whether to put that battery back on charge? The voice in my head is not assertive enough and I’ve done nothing, infact I was meant to rig it up first thing this morning (6.20am) but forgot until I remembered when sat at my desk in the office and then again now as I type this. Hey, maybe I’ll get motivated tomorrow, it’s bound to be wet, I’ll be bored and come 3 O’clock I will decide it’s too late to put the battery on a high charge. Bank Holiday Monday, and lots of thinking while sorting out the work bench I also created a board to hang spanners and other tools on. ‘Sad Man’ said my wife. The cooling system was drained at this point. Yep, it had coolant in it all these years and no anti freeze either, luck that several hard freezing winters hadn’t damaged anything. The water that ran out was pretty clear and rust free. So off with the air cleaner, for a closer look. The battery was re-attached just to see if there was any charge after a day of full charging, and yes! 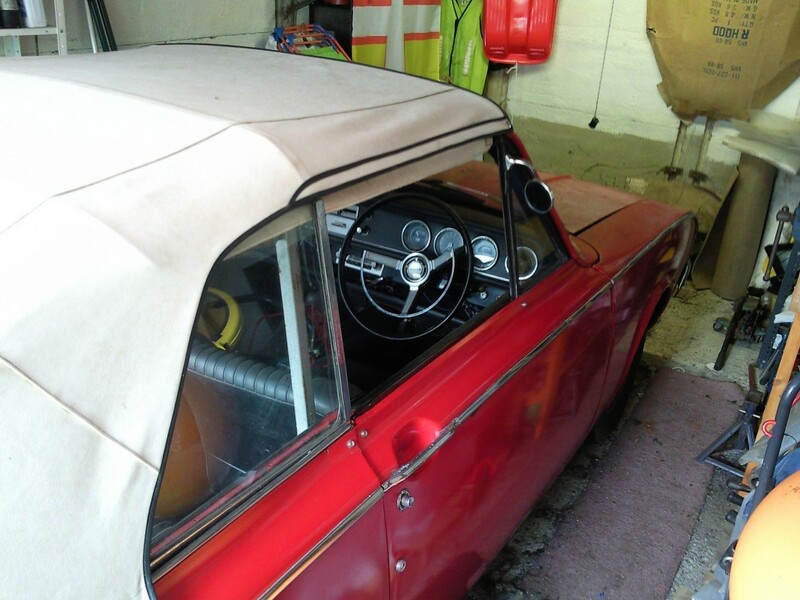 But not to engage the starter motor, but enough for the side lights, fuel pump (electric) and dash lights etc. A note was made to replace the negative terminal as that had broken apart. Throttle linkages seemed seized or very stiff… will need a closer look at a nearby scrapped Corsair to doulbe check things. Next in mind was to see about taking a closer look at the heater matrix, as a possible source of the original over heating problem. The two pipes were disconnected (that go into the bulkhead) just left of centre in the photo. Time to put away, but I’ll be back! 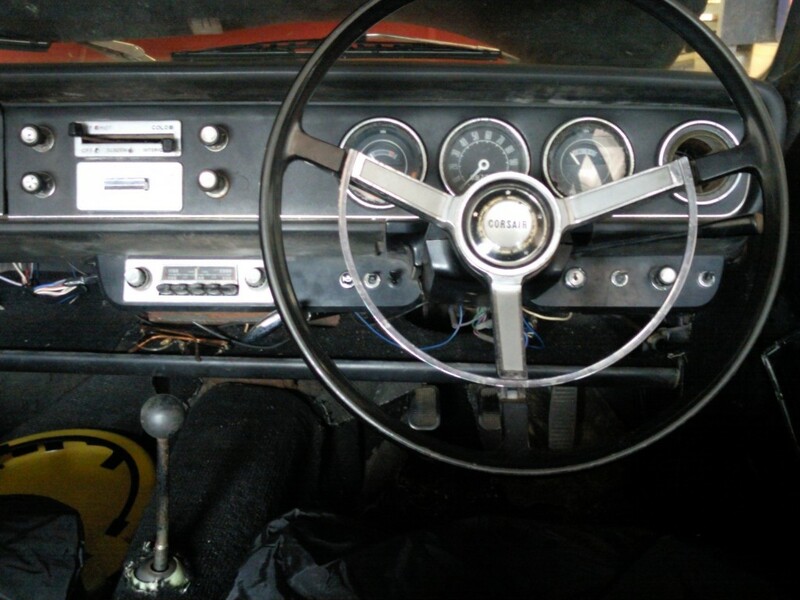 Below is a drivers view of the dash and steering wheel. The Corsair dashboard as seen by Hugh Fearnley-Whittingstall! Well, kind of. 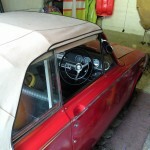 The Corsair finally had it’s “new” spare wheel put on and therefore was rolling again. Then, it was rolled a total of 60cm or about 2ft backwards out of the garage to allow acces to the front of the car and the far end of the garage. The bonnet was opened and then the battery removed to try and see if it would charge. The next job was sorting out some working space so a tidy and clean up ensued. 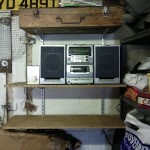 Seeing a blank space on the wall, the idea came to bring the stereo currently in the car port in and on to some shelving found in the clear up. So shelving up, stereo plugged in and radio stations re-tuned and a Genesis cassette (Trick of the Tail) playing, a clean shelf for phone, books, pens and paper, the garage was now sorted. So the Corsair was rolled back in, spare wheels and bikes put in along side and then a phone call from my sons school to say he’d hurt himself on the gravel path and had deep lacerations to his knee. So the Corsair is alone again, but not under it’s dust cover, and the battery? Well it seemed to re-charge, but with no fuel and the clutch seized it seemed pointles trying at this stage. A fair amount of work will be required, but things have started. 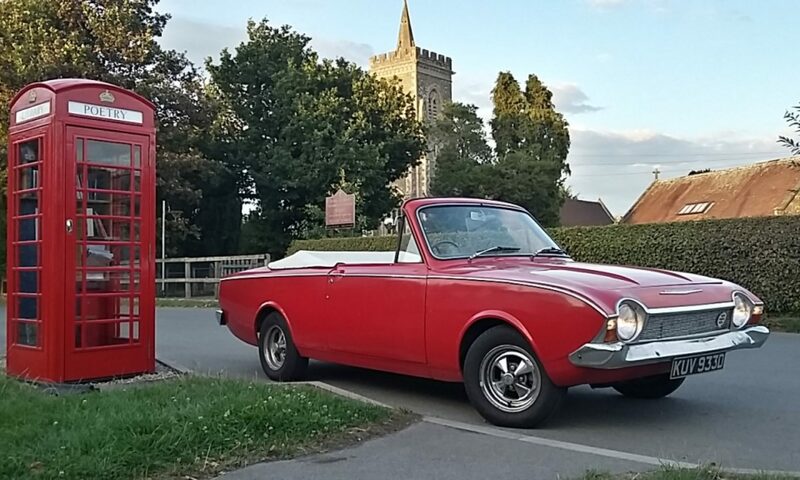 Welcome to the first blog entry about the River Cottage Ford Corsair Crayford Convertible. 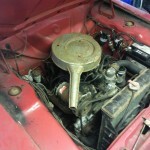 The blog was inspired by the many car builds I’ve been following recently on a couple of forums. 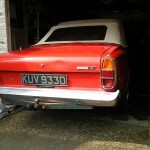 Whilst I’ll never have the skill of those people on the forums, I intend to shed some light on how it really is in my world of trying to get an old and historic car back up and running. There are bound to be several problems, well hey, this is me… along the way and no doubt long periods of inactivity, but don’t give up on me, your words may be enough to spur me on more. Thanks for reading this, see you again?